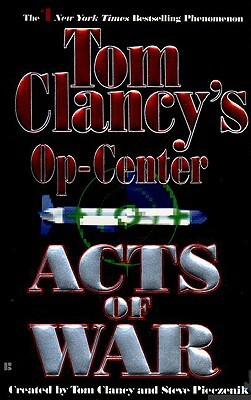 Tom Clancy and Steve Pieczenik are About to Declare War on the Competition. . . . "THE OBJECTIVE"
A SLAM-DUNK In Tom Clancy's all-new, original novel, OP- CENTER: "Acts of War," Syrian terrorists have attacked a dam inside the borders of Turkey, threatening the water supply of their very homeland. It is not insanity, but the first step in a deceptively simple plan: to force all-out war in the Middle East. What they don't know is that a new Regional Op-Center is now on-line in Greece, and its team can see exactly what the rebels are trying to do. But these terrorists are more resourceful than anyone thinks. Description: Mass Market Paperback. Very Good. 1st Paperback Edition. 12mo - over 6¾" - 7¾" tall. ISBN:042515601X. 492 pp. no markings. A suspense novel about a Kurdish plot to blow up a Turkish dam and provoke a super-power conflict.